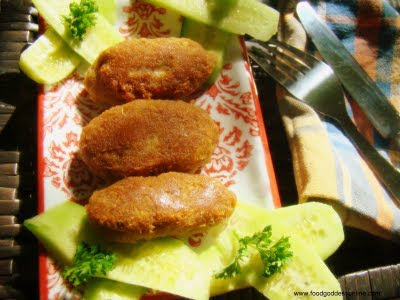 These kababs make fine starters or you could serve them as a snack or simply to fill a tortilla or pita bread along with some mayo and shredded veggies.They are also perfect to add some spark to your chilly winter meals.Enjoy! Pressure cook all the ingredients listed under blending with enough water to cover the mutton about 250 ml for about 4 whistles.Let it cool and if there is any water left in the pan return to stove(do not pressure cook) and cook till all the water is absorbed and the meat is tender.Blend the ingredients to a smooth and fine paste without adding water.Now, add the egg,chopped onions and green chillies and mix well.Roll the kababs into oval shape and slightly flatten in the center or you could simply roll into balls.Heat a non stick pan with some oil and shallow fry on a low flame till golden brown. Suggestion:Serve hot with lemon twists, onion slices and a mint chutney on the side. Variation:You could even some lemon juice to the kabab dough to get a slight tangy flavor. Handy Hint:As mentioned above you could use either boneless lamb or lamb mince, however I find it easier to prepare a firm dough with boneless mutton.Also keeping the rolled kababs in the refrigerator for about an hour helps to firm the dough.You could make these kebabs with chicken meat.Also you could vary the spice content to suit your taste,the quantity I specify are for a moderate heat. Happy Diwali to fellow Indians all over the globe. Presenting to you an interesting recipe mailed to me by my good friend Priya Mathews. This is what she had to say about it - "This was a saver when I had left over vegetable noodles and made a quick fix for my kids evening snack when they came back home from school ravenous and had nothing much else to give them on that day." Toss all ingredients and 1/4 bread crumbs in a large mixing bowl and combine well.Shape into patties ,coat with the remaining bread crumbs and deep fry.Serve hot with ketchup or chinese dips of your choice. A simple yet refreshing dish to indulge your family without shelling out an extra buck right with ingredients found in your store cupboard.This is a rice dish with a mild flavor of cumin seeds accompanied with a tempered yoghurt savory dish to which chickpea flour fritters have been added. Warm oil in a heavy bottomed pan, add the whole spices and when they begin to release their aroma add the finely sliced onions and saute for a minute.Now add the chopped ginger garlic.Remove the whole spices and add the cumin seeds and let them sizzle for a minute.Now add the rice and stir for half a minute and then add the water and salt.Then, let it cook on a medium flame till rice is well done.Garnish with finely chopped green chillies and coriander leaves. Mix all the ingredients listed above into a smooth batter with enough water to a thick consistency.Heat oil and drop spoonfuls of batter into it in batches and fry till golden brown.Remove onto kitchen tissue/towel. Whisk the yoghurt and blend with an additional one cup water.Heat the oil add the cumin seeds, fenugreek seeds, red chillies broken into bits,till they sizzle and splutter, now, add the turmeric and chickpeaflour while stirring all the while and taking care to reduce the flame.Add the yoghurt and make sure the chickpea flour mixes well with it and then add salt and simmer on a low flame for fifteen minutes.Turn off the flame and add the pakoras. Serve zeera rice with kadi pakoda.Also serve a pickle and papad on the side.You could even add a kidney bean dish like rajma masala on the menu to make a great combo. Featured above are foods that are served at Iftar during Ramadan in India.Featured clockwise:Fruit Chaat(Indian Fruit Salad) Dates,Luqmi(curried lamb mince stuffed pastry parcels) Haleem (lentils, wheat and meat cooked in spices) Besan ke pakodey( Chickpea flour vegetable Fritters) Dahi Badey(black gram fritters soaked in tempered yoghurt).In addition to which fresh fruit juices and are also served. 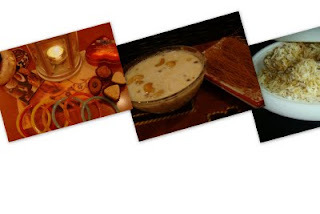 I will delve upon the preparation of some of the dishes like Haleem and Dahi Badey in later posts.Haleem is a dish that has its origins in the Arabic 'Thareed' and 'Harees'.It requires a lot of patience and skill(not everyone can make it to perfection) to prepare this elaborate dish and its prepared specifically for Ramadan. Luqmi(curried lamb pastry parcels)Just follow the qeema/kheema curry procedure from my archives - february posts.Ensure to make it dry and then use as stuffing in pastry wraps and fold them like a parcel.Then deep fry and remove on to plate lined with kitchen tissue. 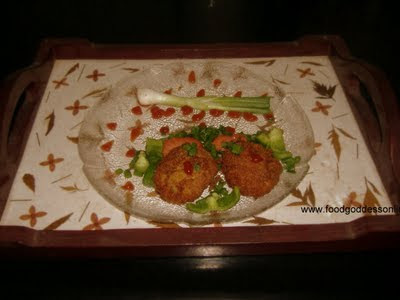 Besan ke pakodey(chickpea flour fritters with vegetables) Mix one cup chickpea flour with a pinch of red chilli powder, salt as required,a pinch of carrom(ajwain) seeds/dried thyme,a teaspoon of hot oil , a pinch of sodium bicarbonate,and a tsp of ginger garlic paste.Add sufficient water a little at a time to make a thick batter(it should not be runny).Now you can use an assortment of vegetables - cauliflower florets boiled (al dente), potato slices, aubergine slices cut lengthwise,bellpepper or any long variety of peppers,green plantain cut lengthwise.Even hard boiled egg slices can be used for a change.Dip them in the batter and deep fry in hot oil till golden brown.Serve with tahini sauce/ barbecue sauce/tomato ketchup. This month kicks off a riot of festivals in India and around the world.I will showcase some of them as the year progresses.First of all 'Ramadan Mubarak' to all.A billion hearts in devotion, thirty glorious nights and 30 days of food and festivities. Although fasting is about abstaining from food and drinks (sunrise to sunset) yet food does become a focal point with so many parties, Iftar buffets and Ramadan food festivals(five star hotels) and not to forget the parties hosted at homes.I will try to portray Ramadan celebrations in the Indian Muslim community in India and Saudi Arabia with a prime focus on food. No Ramadan is complete without dates.The fasting on any day is ended at sunset with a date...(apart from other reasons)probably because dates are high in simple sugars which the body can absorb to give instant energy. In the morning before starting the fast(pre dawn meal -'suhoor')dates are taken with laban(thick butter milk) and in the evening at the end of the fast, dates are eaten with fresh breakfast cream.If you haven't tried dates with fresh breakfast cream then you have missed something..so this Ramadan try the dates with cream.Of course its laden with calories..Enjoy!Also dates are served with qahwah(Arabic coffee) as the coffee which is flavoured with cardamom and brewed in a dallah(coffeee pot)is not sweetened.At every sip biting into a date thats held in the hand with a tooth pick is the custom in Arabian countries.You must try it! 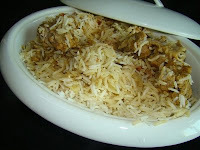 This dish is a popular part of the Mughlai and Punjabi cuisine(Indo-Pak) and I am rounding up the dual delights theme with this one.Do Pyaza refers to the the onions used in two different forms 'do' means two in urdu/hindi and 'pyaz' means onions.Another theory suggests this dish was named in honor of Mullah Do Piaza a scholar and royal advisor who was part of the 'Nine jewels' of the court of the Mughal Emperor Akbar and the Mughal Period was an era of opulence and brilliance in all fields especially Arts and Architecture (Yes! 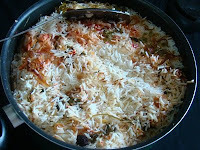 the Taj Mahal was built by his grandson Emperor shahjahan) I hope you will try this dish in your kitchens and please your friends, family and loved ones.So far I have given you four restaurant like dishes to prepare either with vegetables or chicken.However you can make this dish with lamb too. Heat the oil and fry the onion chunks till they turn glossy and remove.In the same oil add the onion paste and fry till it turns golden brown.Add all the spices except the garam masala and keep sprinkling a little water to prevent the paste from catching at the bottom of the pan.Add the tomato puree and the chicken pieces toss fora minute then add 1 cup water and let cook till chicken is tender.Now, add the diced onions and mix well and it's ok if the onions separate into layers.Add the garam masala and serve hot garnished with finely chopped coriander leaves.If you wish you can add 1 tbs yoghurt or cream to thicken the onion gravy. Like always substitute the chicken with a packet of mixed frozen vegetables. This is a wonderful dish that transforms the everyday shrimps/prawns into sizzling sirens..um well not literally but sizzle they will in spices and scents.If you are having a romantic dinner then this is a dish you would want to impress your partner with your culinery skills and if you live in a house that has a great view of the sea side then you can bet you have the best opportunity for memorable moments.. while you feast on the prawns your senses are soaking in the exhilarating scents of the sea. Coming back to our recipe let the name 'tawa' not baffle you as its simply an Indian term for a griddle.The prawns are well marinated in some exotic spices and cooked on a griddle while taking care not to overcook the shrimps/prawns.Well, if my vegetarian friends are wondering I have ignored them then do not lose heart as you can still impress your partner with a veggie version using paneer, a soft cottage cheese that's extensively used in Indian cooking.You can make it in advance or use a frozen ready- to -eat version available in Indian sections of supermarkets like, Al Kabeer for instance.You can use a non stick one in place of the iron or aluminium tawa. Method: Marinate the prawns/ shrimps with vinegar,spice powders, fenugreek leaves and salt for half an hour.Heat the oil on the tawa/ griddle/ non stick flat pan and add the cumin, caraway and carrom seeds.Now add the finely chopped onions and saute them till they turn golden brown now add the ginger-garlic paste, green chillies, tomato puree and keep stirring from time to time and cook till oil appears at the edges and now add the marinated prawns/shrimps and cook till the shrimps curl up and turn pink.Then,add the fresh cream and chopped coriander leaves or dill and mix well. Serve hot with bread, salad and drinks. Cut the paneer into small cubes and shallow fry them in a little oil till golden brown after marinating them with the same ingredients used for marinating the shrimps,the rest of the procedure is same except add a few crushed peppercorns and its entirely optional if you want to keep it a little mellow.Also you could make this dish with tofu as it is almost similar in appearance to paneer but tastes a bit bland in comparison. Wash the fenugreek leaves and add 1/2 tsp salt and leave for twenty minutes and squeeze out the water as this process helps remove the mild bitterness in the leaves.If you are using the dry herb version of fenugreek then omit the above process.Wash the chicken pieces and drain water thoroughly. Heat 2 tbs of oil and stir fry the onions till reddish brown and remove. Blend the onions,ginger, garlic, green chillies, cashew nuts, cumin seeds and the spice powder into a fine paste. In the pan add the remaining oil, the 1/2 tsp cumin seeds and when they begin to sizzle add the fenugreek leaves/dried herb and toss about for a few minutes.Now add the blended onion and spice paste saute for a minute now add the chicken mix well, add the tomato puree, 1/3 cup water and let it cook till chicken is tender and the oil separates.Lower the flame add the cream and mix well for a minute and then turn off the flame.Do not over cook the chicken or add too much water. This version for vegetarians contains one cup boiled green peas and 1 large capsicum(bell- pepper)in place of the chicken.Add the peas after the blended paste is well cooked and add the capsicum toward the end to retain the crunchiness. 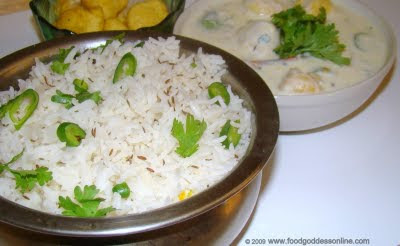 Dalcha gosth is an accompaniment to pulao or biryani in Coastal Andhra.It can be served with steamed rice on days when you make something like shikampuri kababs or mutton fry.It tastes delicious and I have even found a version of it served in Malaysia with biryani, of course this contains a lot of other vegetables too, and far too spicy but it tastes the same.The mutton with the bone adds a lot of juices that help in improving the taste of this stew.It is also made in Hyderabad and here the souring agents are varied- lemon and green mango is used as a variation depending upon the season. Clean mutton and trim fat, leave bone in.Marinate it with the turmeric, chilli powder, salt, ginger garlic paste, garam masala, green chillies and coriander powder.Heat the oil in a thick bottomed pan add the cumin seeds, curry leaves stir, for a minute. Add onions that have been chopped finely and when they turn translucent add the tomatoes and cook for sometime till they turn soft and mushy, now add the mutton and cook till tender.Pressure cook dal/lentils till soft and mash them with the back of a ladle or spoon.Add this to the mutton and then add the boiled green gourd/lauki let it cook.Now, add the tamarind extract and simmer on a low flame till oil separates and appears on the edges of the pan.Add the coriander leaves and turn off the flame. Under the theme of dual delights I would like to inform my vegetarian readers they can make this without the mutton.You can either use chicken stock cubes or if you are too strict about it you can replace this with vegetable stock.The stock improves the flavor of the stew like the lamb used above. This month I plan to introduce recipes that would please both vegetarians and non vegetarians alike.Inspired by the concept of Yin and Yang in Feng Shui,Gemini twins ofthe zodiac and the dual function gadgets and gizmos I have named them Dual Delights.I know I haven't been posting lately and the reason has been that I was busy shifting to a new home.Hoping to be regular from now on.I also hope you will like my humble offerings(the way they say it in India).Enjoy ! 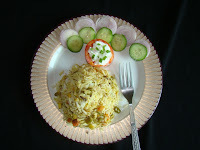 Tamatar ki chutney is a Hyderabadi alternative to sambar,khatti dal and rasam, typical accompaniments to rice along with curries.Although it is paired with khichdi which I had posted previously it tastes good with steamed rice too.It is simple to make and you could make it on days when you are lazy to reach for that pressure cooker to make sambar,or dal based accompaniments, or simply when it is raining tomatoes in your garden. and you can mash them up with the back of a stirring spoon and remove the ginger piece.If you are still feeling lazy, then you could blend it after cooling, into a smooth pulp.Take a non stick pan and heat the oil and add all the ingredients listed under seasoning and when they crackle and sizzle with a nice aroma just add the tomato pulp and stir to combine all ingredients and you have it ready to serve in a bowl. 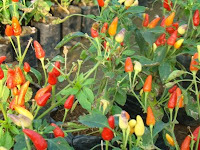 Variation: You could add two green chillies to the cooking tomatoes if you wanna spice things up. Semolina/suji/smeed/farina/rawa whatever you are used to know it as is versatile and can be made into numerous savoury and sweet dishes.This dessert known as halwa is very easy to make and you will have people asking for more.The addition of almonds takes this dessert to sublime heights.Try it ! Procedure: Heat a little ghee and toast the cashews,and raisins and reserve for later use.Now add the remaining ghee to the pan and roast the semolina till it turns a golden color, now add the almond powder and keep stirring.Add the milk, sugar, cardamom powder, saffron, and cook till the semolina turns soft.Keep stirring to prevent it from burning at the base.Add the raisins and cashews.It can be served warm or cold.You could also use slivers of pistachio with the nuts and raisins. It's summer and mangoes are in abundance.The Badami variety is one you must absolutely not miss.In India eating mangoes everyday in summer is almost a ritual and then you have the unripe ones being cooked with dal(lentils) and yes even lamb.Coming back to desserts, mango sorbet is undoubtedly heavenly and if you are craving ice cream I can assure you a sorbet is a good low calorie option.This sorbet can also be made with melons,peaches and pineapple.Mango sorbet is great after a good spicy meal.On a lighter note, if this one puts you to sleep after a heavy meal you can be assured of a midsummernight's dream(pun unintended). Chill a glass bowl and add the mango pulp,lemon juice and orange zest,mix well.Add the egg whites and sugar.Cover with a clear film and freeze for an hour.Remove from freezer and beat once again well to mix the contents.Refreeze until fully set.While serving remove the sorbet a good five minutes earlier and whisk to remove any crystals until you get a smooth texture.You can serve this with mint garnish and honey or double cream as topping. Put the flour in a bowl.Make a well in the centre add the butter, oil, egg, powdered sugar, cream cheese, baking powder and water.Knead to a soft dough adding water as you need.Shape the dough into round cookie shapes or you could work out more shapes and arrange on a slightly greased baking tray.Brush with the egg yolk and milk mixture and sprinkle sesame seeds and black seeds liberally.Bake in a a preheated oven of 350 degrees F until golden in color,to obtain crunchy cookies. Combine sultanas,corn flakes,peanuts/almonds,cherries and condensed milk in a bowl.Mix Well.Place the mixture on a baking paper lined tray.Make diagonal lines.Bake in moderate oven about 10 minutes or until slighlty browned and cool on trays to obtain diamond shapes.Store in an air tight box. Boil milk and add the saffron while its hot to infuse the color and let it cool.In the meantime blend the almonds, fennel and cardamom pods to a smooth paste.Now add the rest of the ingredients except the rose petals and blend well.Sieve the liquid.Now fill up individual glasses with crushed ice upto 1/4 th level and add the sherbet sprinkle with rose petals and serve.You could use silver or stainless steel glasses to give that traditional Indian touch. Blend all ingredients in a mixer till frothy.Serve in chilled glasses.As an option, you can add 2 tbs mango pulp to make a mango flavored lassi. Blend carrot into smooth paste add the pinepple juice and other ingredients and blend further while adding the ice cubes one at a time till a smooth liquid is obtained.If the liquid is too thick add pineapple juice or ice to thin it. 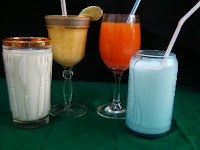 Mix the coconut cream with pineapple juice and crushed ice cubes in a mixer.Fill tall and chilled glasses with the juice, add some finely chopped pieces of pineapple.Decorate the glasses with pineapple slices. Jyotsana had asked me for an easy egg curry and here I'm posting one.This egg dish is known as Derwaishi andey(eggs) in my in-laws home.As a new bride when I had been over to their place, shortage of a dish at dinner time had them discussing about making this recipe.As the name had a great feel to it, I had imagined it would be some special and lavish dish coming up, only to realize that it was a humble egg curry nevertheless it was so delicious.Later on, my husband told me about the reason behind its name.In his childhood, they had a neighbour in whose kitchen this dish was frequently made and sent over to their home,so from that time on, my mother-in-law had called this by his name -Derwaishi.When I am tired and don't feel like cooking, my husband sometimes makes this dish for me and it's very yummy. Method: Take a wok or a flat pan, add the oil and when its warm, add the onions, chillies and tomatoes, keep sauteing on a low flame till the onions turn translucent. Add the turmeric, chilli powder and salt along with half to one cup of water and simmer on low flame till the onions are well cooked and soft.Now break the eggs and add it to the pan don't stir the eggs as they have to cook in the natural shape they take in the pan.All the while, take care to keep the flame low add the spring onions and coriander.When the eggs are cooked and sit firm on the onion gravy,you can turn off the flame and serve hot. If you like plenty of gravy to go with your rice or bread dishes this is an excellent choice.Kormas have a creamy yoghurt base while some also include rich paste of nuts like almonds and cashews to increase the consistency of the dishes.You can make this korma with either lamb or chicken.This one does not require almonds or cashews.You can use a variety of breads, naans paranthas, or even Arabic Khubs to mop up the gravy.I have used boneless chicken breasts to lower the calories and chicken breasts are known to be rich in thiamine, niacine and iron minus the fat. Method: You can use either boneless or meat with the bone,trim fat and wash the meat clean. Now marinate it with turmeric, chilli, salt, coriander powder, green chillies and ginger-garlic paste.Mix well with your hand to infuse the flavours into the chicken.Now add the sliced onions to the oil in a thick bottomed pan and saute till golden brown add the marinated chicken pieces.Lower the flame and carefully add the beaten yoghurt stirring continously with the other hand to avoid the yoghurt from curdling.It should blend well into the chicken.Add the garam masala and let it cook till the chicken is soft and succulent.The yoghurt should form a thick gravy and colour should turn a rich golden yellow.Add the mint leaves and coriander leaves and turn off the flame.If you are using the mutton the procedure is same except that you add the yoghurt after the lamb pieces have been cooked to tenderness with the marinated spices and a cup of water. This is inspired by Goanese and Kerela style of cooking fish.As you know the coast is synonymous with abundance of coconuts the locals all over the coast of India use coconut to add a zing to their fish dishes.For all you fish lovers there are a few essentials you can't do without while cooking fish ...carrom seeds(ajwain,vamu)which when added to fried fish makes it absolutely delicious, and there is coconut,mustard paste(sarson,rai,avalu) and cumin powder(zeera).Sea food is absolutely healthy,so go ahead and indulge in your seafood cravings. 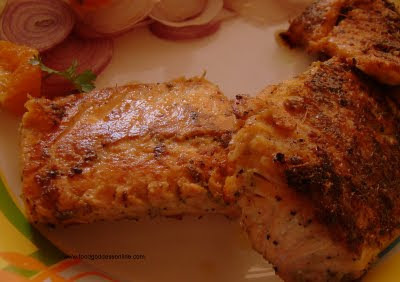 Method: Clean fish and marinate in vinegar,lemon juice ,turmeric and chilli powder with some salt in a non metallic bowl.Grind coconut with green chillies and also blend tomatoes into a paste.Heat oil and fry onions till golden brown add the curry leaves,ginger-garlic paste and the coconut paste along with tomatoes, coriander powder, garam masala and let it cook for a few minutes.Add the fish gently, don't stir as fish may break. Now, add cumin and pounded fenugreek powder.As water seeps out of the fish you may not need any more but if the curry appears dry you can add half a cup of water.Let it simmer gently till the fish is cooked and oil separates and the curry reddens and thickens, add any more salt if required.Garnish with coriander leaves and serve with rice or roti. Method: Trim the fat and wash the lamb cubes in a glass bowl mix the cubes with ginger garlic,chilli and turmeric powder,2 tbs oil, and salt .Mix well transfer it into a wok or kadai add one cup water and cook till meat is tender keep adding water if it dries up till the meat is cooked. Alternatively you can cook it in a pressure pan for four to five whistles, and let it cool, remove lid and return the pan to the stove. Add the remaining oil and garam masala and keep tossing from time to time, till the masala sticks to the meat pieces and there is no water left. Sprinkle a pinch of chilli powder, give it another minute and put off the flame.Garnish with coriander and serve.It is excellent with roti or steamed rice. and these delicious kebabs have a stuffing of yoghurt, onion and chopped coriander. Method: In a pressure pan add all the ingredients listed for kebabs with a tbs oil and 1 cup water and pressure cook for four whistles till meat is tender and completely dry. Now blend all the ingredients in a mixer without any water, or you can add a few tsps a little at a time if its too dry and grinding the paste is difficult. Now add salt and mix well. It should have a soft, dough like consistency. In the meantime mix all the ingredients listed under stuffing and keep aside. Make a flat ball like shape with the kebab dough and now add a little stuffing and cover it with another flattened round ball and pat till it forms a full rounded ball and flatten it on the top. Shallow fry in oil.Serve as a starter or accompaniment to a meal. You can also add two kebabs in pita bread or rumali roti and roll it along with onions lettuce and tomato to form an excellent meal. This is an absolute nutritious and complete meal and every Hyderabadi will swear by it.Born out of a desire for a perfect brunch on those lazy weekend mornings when one gets up late,it is easy to prepare and must be accompanied with pickles and papad.Try it out for a weekend lunch and be prepared for extra kisses and hugs from the family.It can also be paired with an egg bhurji(scramble) done up in onions tomatoes and chillies in place of the kheema (lamb mince)and you have a dazzler in recession times. Ingredients: 1 cup basmati or long grained rice, 1/3 cup of moong and or masoor dal,1&1/2cups water,3 tbs oil, 3 tbs ginger -garlic paste,2 onions sliced, 2 green chillies slit,1/3 tsp turmeric ,some mint and coriander leaves(pudina-koth meer/hara dhanya) salt to taste. Method:Warm oil in a deep pan add onions and chillies saute till they turn translucent,add the ginger-garlic paste,pudina leaves,now add the dals and rice saute for some more time and add water along with turmeric and salt.Cover and cook but take care to remove lid while its boiling and then reduce flame to sim till the water begins to dry and the rice is cooked.Now garnish with the coriander leaves.It should take about 15 minutes. Kheema: 1/2 kg lamb kheema, 4 onions chopped finely,3 green chillies chopped,one tomato chopped, 3tbs ginger -garlic paste, 1/2 tsp turmeric,1 tsp red chilli powder, 4 tbs oil, 1/2 tsp garam masala powder,1tbs coriander powder, green coriander leaves for garnishing. Method: Clean the mince, trim fat wash and keep in a glass bowl now add to this all the above ingredients except oil, garam masala and reserve a few coriander leaves for garnish.Mix well and then warm the oil in a thick vessel add this keema mixture and saute for 5 minutes and let the water dry up now add 2 cups of water and let it cook till the keema is tender.You can add more water if the minced meat is a little tough.Garnish with coriander.Alternatively you can cook in a pressure pan for three whistles and once the steams out you can leave it on to simmer to dry up the water.Adding potatoes and green peas is optional while cooking the keema. Khatta is an interesting take on the Andhra dish called pachchi pulusu except that it is modified with the addition of sesame seed (til/nuvvulu/)paste.I have further modified it by adding a few peanuts to the sesame seeds and then making a smooth paste.You can omit it if you wish. peanuts roasted and blended into a smooth paste,1/2 teaspoon cumin seeds, 1 onion and 2 green chillies chopped finely.Salt to taste,2 tsp oil and a pinch of turmeric and red chilli powder. Method: Extract tamarind juice by soaking it in the cup of water.Toast the cumin seeds in the oil and add to the tamarind extract add the salt, turmeric and chilli powder.Mix well.Now add the blended paste add the chopped onion and green chillies.Mix well and serve.